NTFS and FAT32 are two different types of file system under Windows operating system. NTFS is an advanced file system which provides better performance, reliability and security than FAT32 file system. However, you may want to convert a partition from NTFS to FAT32 file system in some situation. Traditionally, you can format a NTFS partition to change its file system to FAT32, but all data on the partition will be erased due to formatting. 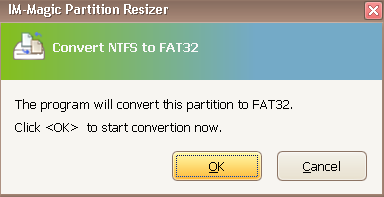 If you are looking for a way to convert NTFS partition to FAT32 without losing any data, IM-Magic Partition Resizer has the ability to convert partition from NTFS to FAT32 without formatting, so you will not lose any data. How to Convert Partition from NTFS to FAT32? Step1. Right click the NTFS partition and select "Convert to FAT32" option. Step2. Click "OK" button to confirm convert the selected partition to FAT32 file system.